Mother’s Day is Sunday the 10th of May this year and we have the perfect ideas to help you celebrate this special occasion. Surprise mum with a weekend escape. Book a River View Room at Crowne Plaza Perth and let her relax on her own private balcony. Spoil mum with a delightful Mother’s Day Breakfast at Gusti Restaurant or enjoy Mother’s Day Lunch on Palm Deck with views of the Swan River. After your breakfast or lunch explore beautiful Perth city and shower her in love because there really is… no one in the world quite like mum. Touch her heart with a delightful breakfast at Gusti Restaurant this Mother’s Day. Indulge in a selection of favourite breakfast items plus special editions just for mum. She (and you) will love the chocolate fountain plus we’ll give mum a glass of bubbly on arrival. Mum will also have the chance to win a weekend escape. Mother’s Day Breakfast: 6.30am to 11.00am $40pp or $35pp for in house guest. To see the menu and book, click learn more. We may not want to admit it but we say something and it reminds us of Mum! Go to Crowne Plaza Perth Facebook page (Click Here) find the competition post about Mother Day Quote. Comment and share a QUOTE you often say that you got from Mum. The best comment will WIN the BEST Mother’s Day Weekend! Overnight accommodation at Crowne Plaza Perth in a River View Room on Saturday night AND table for 2 the next morning at our renowned Mother’s Day Buffet Breakfast in Gusti Restaurant. Don’t forget if you’re friends with Mum on Facebook to tag her in the comment. Letter from Mother to Daughter for Mother’s Day. 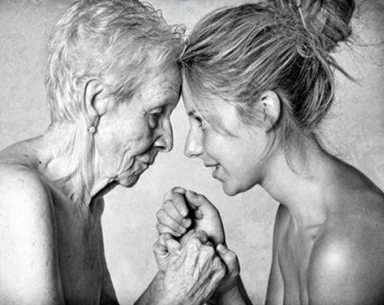 “My dear girl, the day you see I’m getting old, I ask you to please be patient, but most of all, try to understand what I’m going through. If when we talk, I repeat the same thing a thousand times, don’t interrupt to say: “You said the same thing a minute ago”… Just listen, please.Try to remember the times when you were little and I would read the same story night after night until you would fall asleep. When I don’t want to take a bath, don’t be mad and don’t embarrass me. Remember when I had to run after you making excuses and trying to get you to take a shower when you were just a girl? If I occasionaly lose track of what we’re talking about, give me the time to remember, and if I can’t, don’t be nervous, impatient or arrogant. Just know in your heart that the most important thing for me is to be with you. And when my old, tired legs don’t let me move as quickly as before, give me your hand the same way that I offered mine to you when you first walked. Join the sea of pink and represent the fight against cancer and the research to learn more. 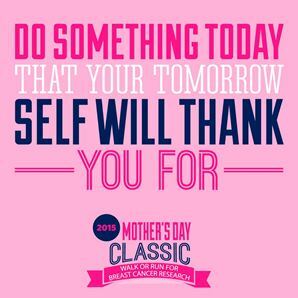 Mothers Day Classic annual fun run/walk will take place on Mothers Day in Langley Park Perth. The event brings the community together on Mother’s Day to support and remember those touched by breast cancer. Distance: 4/8km walk OR 4/5km run. The circuit is around Langley Park Reserve and part of Riverside Drive. Crowne Plaza Perth is the perfect location to explore everything Perth has to offer. We are have balconies with panoramic views of the Swan River. Step outside and you will find beautiful Langley Park. Walk a short distance and you are greeted by the Swan River. Take mum for a nice stroll by the Swan River and stop in for a coffee at Barrack Square. If you are feeling adventurous hire a bike from concierge ride over to South Perth and see the city skyline. For a magical day pack up a picnic and take mum up to Kings Park. Discover the Wildflowers and walk among the treetops on a 52 metre glass and steel arched bridge. For more information about Mother’s Day Breakfast, Mother Day Lunch or accommodation promotions please contact us.